In 1943, he engraved twenty burins for Saint-Jean-du-Ciel by Roger Secrétain. The same year, Louis-Joseph Soulas agreed to become the chairman of the Société des Artistes Orléanais, created in 1923 by Maurice Genevoix. He held this position until his death. 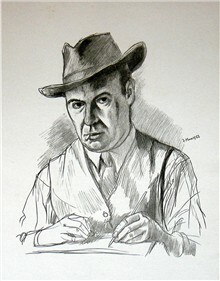 In 1946, he illustrated la Marche à l'Étoile by Vercors, and Présentation de la Beauce à Notre-Dame de Chartres by Charles Péguy. The year after he engraved a series of woodcuts that he put together in a collection entitled Quinze Gravures des Ruines d'Orléans. "Fifteen views of the wounded and mutilated Orléans" as he used to say. He also made wood engravings for Petit Voyage autour de ma Bibliothèque by Pierre Réveilhac. In 1948, his work included engravings from gouaches by Pierre Guastalla for l'Autoclète by Alfred Jarry, and sixty burins for Rémi des Rauches by Genevoix. In 1949, he produced engravings of Présentation de la France by Jules Romains, and ten copper engravings and two woodcuts for his Portrait de Soulas by Jacques de Laprade in 1950. In 1951 he engraved woods for Notre-Dame de la Beauce by Jean-Louis Béchu, some burins for Journal d'un Curé de Campagne by Georges Bernanos and in 1952 he engraved copper plates for Une Promenade en France published by Les Halles aux Cuirs Réunies. On several occasions, he was a member of the jury for the Prix de Rome of engraving. He also joined the "Peintres Graveurs Français" and was one of the founders of the "Jeune gravure contemporaine" at the end of the twenties. Beginning 1945, he was the chairman of the Club Orléanais du Cinéma.